In the beginning of the smartphone era almost a decade ago, it was easy to impress customers with the possibilities new devices and technologies provided; the leap of progress was huge, even maybe it was a small change presented as a new way of dealing with the convenience. Over the years, customers shifted to mobile devices, adopting new technologies with the goal of simplifying their lives and demanding more from banks. Forrester predicts that by 2017, 108 million customers in the United States alone will be using mobile banking. 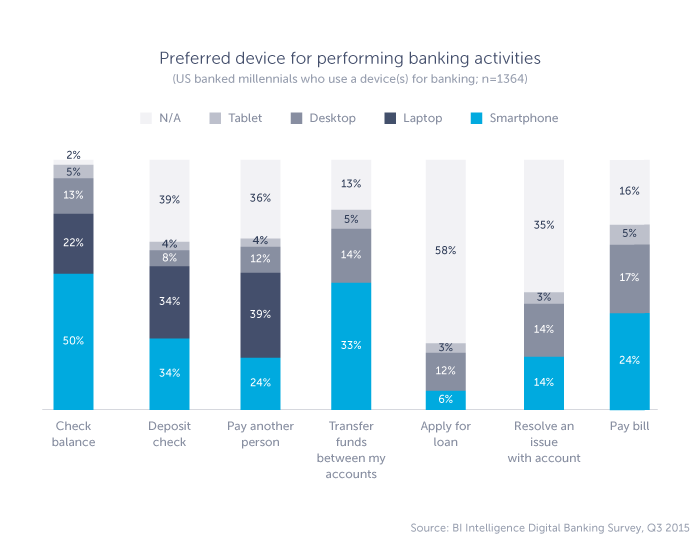 Mobile banking stands out from the rest of the industries affected by mobile technology due to millennials’ willingness to use feature-rich banking apps. 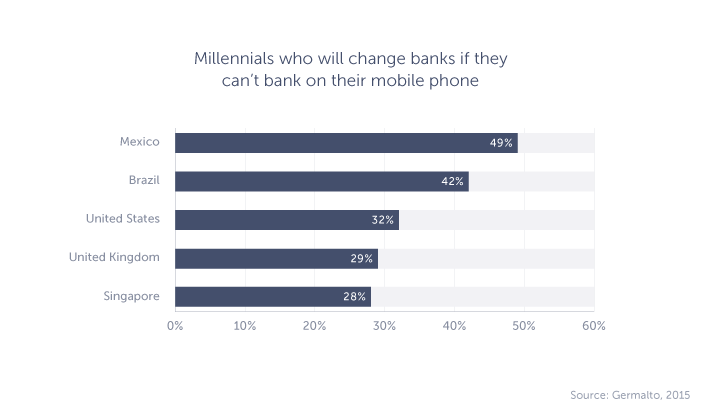 A study by the Federal Reserve reported that millennials’ mobile banking usage in now close to 70%, compared to 18% of consumers aged 60 or over. As the way in which we handled our finances changed, banking also needed to keep up with mobile trends to survive in a mobile-first customer environment by tailoring their businesses to suit customers’ needs and creating mobile apps. Not long ago, it was a common practice to go directly to local bank’s branch to make a simple transaction or transfer funds. Then came telebanking, and then banks finally spruced up their websites and started offering services on the web. However, with the mobile evolution, opening a mobile bank app on a smartphone is a strong alternative to going to a bank branch. The ability to access information in just a few clicks from our smartphones changed how we access our bank accounts. With a mobile banking app, customers can check their bank balances, transfer funds, or make payments in just a few seconds. 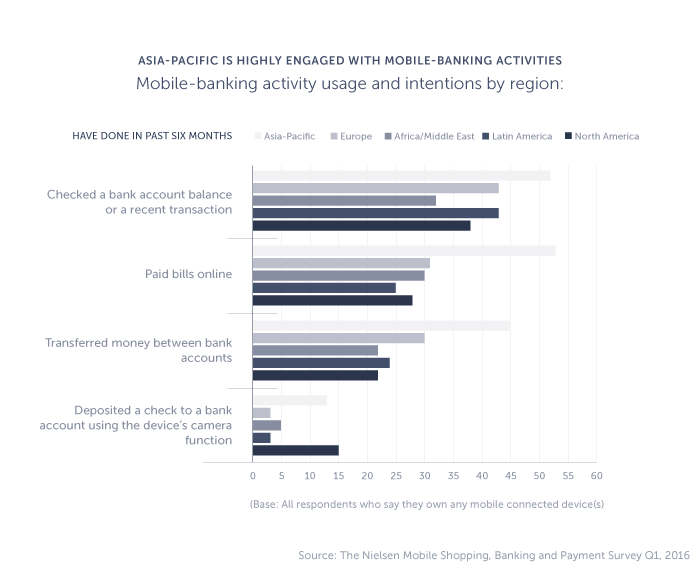 In a recent Nielsen survey, nearly half of the global respondents (47%) said they had checked an account balance or conducted a transaction on their mobile devices in the past six months, and 42% said they had paid a bill using their mobile devices. Customers have evolved from passive recipients to hyper-informed ones, constantly looking to get more from their mobile devices. Therefore, mobile banking needed to extend the portfolio of services offered by mobile apps, resulting in new sales and communication channels. By adding some simple services to their mobile apps, such as checking bank balances and transferring funds, banks realized the enormous potential those apps have for their customers and their businesses. Banks started building mobile apps with more complex services available, such as requesting loans, opening savings accounts, or making mortgage payments. In 2015, Bank of America reported over 18 million active mobile banking users and its biggest annual earnings in nearly a decade as well as a 29% growth in bill payments and a 20% percent growth in money transfers. The report also showed a trend of customers opening new accounts through mobile apps, with sales increasing by 50% over the previous year.Tracking customer behavior in apps by interpreting collected data creates a chance for banks to offer products and services that better fit their customers’ needs. In addition, sales and marketing teams now have new channels to market new services and to upsell and cross-sale services since 70% of customers are willing to provide their banks with more information if doing so leads to increased personalization or better service. Banking apps are not only fulfilling customers’ needs but also lowering banks’ operational costs by reducing the need for physical branches. Last year, there were more than 1,600 bank branch closures in the United States. A study titled “Digital Disruption” by Citi predicted that by 2025, up to 30% of current employees could lose their jobs because of new technologies. However, this does not mean that jobs at bank branches will disappear; these employees will simply need to jump into different roles. Customers still have positive perceptions of physical branches due to the human touch they provide when it comes to long-term financial decisions, such as mortgages. The shift will require employees and banks to open new, customer-oriented departments to provide individual and personalized support, focusing on small business loans, personal investment advice, and help with the onboarding process and mobile issues. Mobile banking is growing and evolving rapidly, pushing innovation in the first plan. We are witnessing the dawn of new mobile banking solutions that are trying to change the mobile banking experience from the inside out. Simple and Moven are working on changing the banking experience as we know it. Their mobile solutions include all the regular services you would expect from a banking app, such as tracking expenses and making mobile payments. However, they are paving the way and raising the bar for other players on the market by building apps and integrating exciting new features. With Simple, you can create Goals. A Goal is a digital envelope that allows you to save and stash away funds daily. Users can set aside discrete amounts of money for specific purposes and effectively hide money from themselves before they spend it. On average, Simple customers who use these Goals save twice as much as those who do not. Another exciting feature is Safe-to-Spend. This feature allows users to spend spontaneously and worry less about overspending their monthly budgets by calculating the difference between their total balances and all their scheduled bills and Goals. 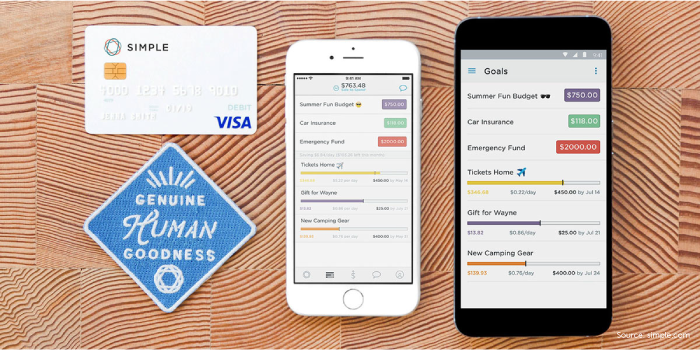 Simple also offers a way for customers to visualize their spending, discover how they really spend, and find easy ways to save money. The app can search and analyze every transaction made from a bank account while allowing users to add notes, photos, and hashtags to any purchase. Best of all, Simple does not charge any fees, not even maintenance, card replacement, or minimum balance fees. Moven’s mission is to change how people engage with their banks by delivering mobile-first, customer-centric solutions. Moven is a financial service provider that creates digital bank accounts and provides an innovative app that provides real-time insights to empower users to make informed decisions that directly affect how they save and spend money. Mobile banking adoption resulted in a few banks trying to position themselves as pioneers of a new type of banks: mobile-only. While all major banks provide some form of mobile banking, with either a smartphone app or a mobile website, these new banking players only offer digital solutions and do not have a single physical branch. German mobile bank N26 is on a mission to replace traditional banks. To become a client, users must install the company’s app and have a short video call with a clerk. During the call, the bank representative turns on your front phone camera to take your profile photo and scans your passport through the back camera of your phone. In only few minutes, you have new bank account, debit card, and credit card—pretty elegant, right? 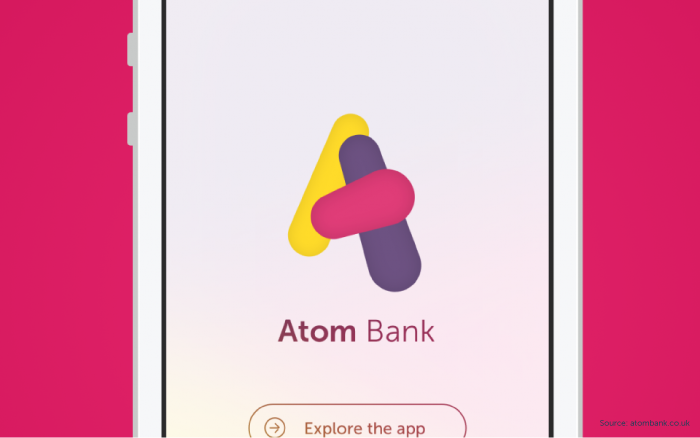 The UK’s first bank built exclusively for mobile is Atom Bank, which aims to disrupt the banking industry just as Uber did with transportation. Even before this app-only bank officially launched, the startup was valued at around $226.6 million after only 18 months and landed a massive investment of $68 million from Spanish bank BBVA. Atom’s app provides complete customization with some high-end features. Opening an account is simple, and the process can be completed in just a few steps. For authorization and registration, users do not have to enter usernames or passwords or scan a photo ID since the app uses biometric security. The app currently relies on face and voice recognition, but the company announced that it will implement fingerprint ID and eye scans soon. Once those features are introduced, users will set up three forms of biometric ID, two of which are mandatory, and a six-digit passcode to access their accounts. 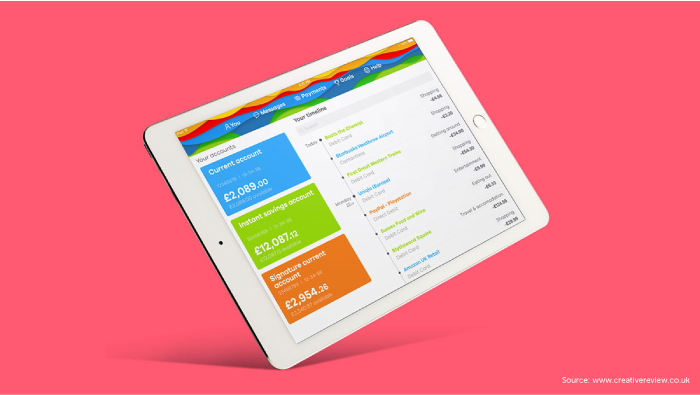 Clydesdale Bank and Yorkshire Bank launched a digital banking service and created a mobile app: B. B promises to make everyday banking simple and intuitive for every financial action, from checking account balances to making payments, while providing tons of tools that allow users to take control of their funds. B’s set of features allows users to tag purchases or set up their own savings and budget targets. One feature collects financial data to predict how a user’s account balance will look at the end of a month based on previous behavior. If users are about to fall a little short, the app will send an alert, or if have some extra funds, the app will suggest spending or move funds to savings. B also integrates with Apple Pay, making wallet-less payments just a fingerprint away. The evolution of mobile banking has begun, with biometric security, smart automated savings, and deep expense analyses being introduced. So, what can we expect in the near future? With the rise of virtual digital assistants, such as Siri, Cortana, and Google Now, and apps being opened up to third-party developers, mobile banking will become completely consumer-centric. As digital assistant capabilities become smarter with every OS update, users will not even need to tap on their devices; voice commands will allow users to manage their bank accounts, make payments, and analyze their spending. Bankers will need to acquire a much deeper understanding of their customers and push services that go beyond transactional. Connecting data from third-party apps, learning about customers’ saving habits, and analyzing customers’ spending behaviors will allow banks to create complete profiles of individuals and lead to powerful intelligent interfaces. This will result in complex portfolio management tools that allow users to obtain complex risk analyses on long-term investments and assistance when applying for mortgages or investing in emerging markets, high-yield bonds, or stock market bonds. Over one-third of the world’s population now owns a smartphone, and in the next four years, that piece of the pie will expand to 70%. With one in three adults relying on mobile banking by 2020, customers will push banks in one direction if they want to survive: going mobile. In just a few short years, smartphones have become a perfectly common item, and so have mobile apps that enable users to acquire information simply and quickly. 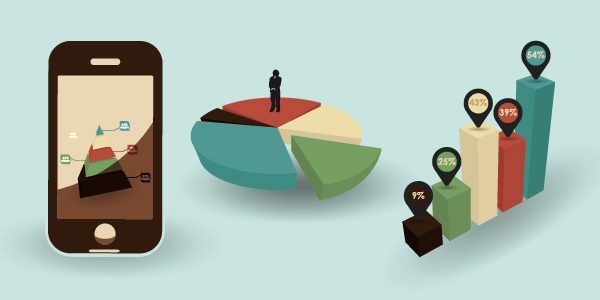 The app marketplace has become enormous, and yet you’re still wondering whether to invest in mobile apps? You’re still not sure what you’d have to gain? 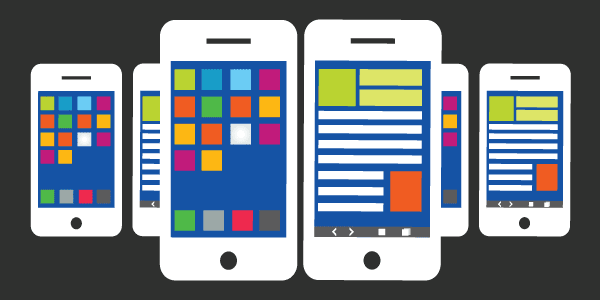 Accessible, attractive, practical and offering a greater range of functions – these are just some of the advantages of native apps over classic web applications.